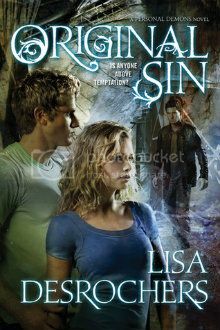 Note: Original Sin is the second book in the Personal Demons trilogy, and this summary may contain spoilers. Goodreads Summary: Luc Cain was born and raised in Hell, but he isn’t feeling as demonic as usual lately—thanks to Frannie Cavanaugh and the unique power she never realized she had. But you can’t desert Hell without consequences, and suddenly Frannie and Luc find themselves targeted by the same demons who used to be Luc’s allies. I really enjoyed Personal Demons, so I was eager to continue the story with Original Sin. So many of the things I loved from the first book carried over here - Frannie's voice and the romantic chemistry to name a couple - and in this installment, all of the stakes get higher. Frannie, Luc, and Gabe went through a lot in Personal Demons, but the story is far from over. Demons will be demons, and they are none too thrilled with the turn that Luc's mission took. Therefore, they have no intention of leaving him - or Frannie - alone. Frannie might have a new guardian angel, but it isn't enough to keep the demons away permanently. On top of that, Frannie's friend Taylor has been acting strange, and Frannie is determined to find out why. With so many evil forces at work, Frannie and Luc will have to figure out a way to stay off the demons' radar or send them back to Hell empty-handed - and quickly. But can they survive everything Hell has to throw at them? Though Personal Demons often seemed cliche, Original Sin was not quite what I was expecting. Instead of simply following Frannie, Luc, and Gabe, new characters were introduced - a new guardian angel for Frannie and a new neighbor for Luc - and these two factor heavily into the story. Frannie's new guardian angel even has chapters from his point of view, further bringing this second storyline into play. Lili, the next door neighbor, is a powerful presence and an extremely interesting (if not always likable) character. Frannie's world seems to be crumbling in this book, and she definitely had her struggles with the demons. She is still trying to come into her own, and I look forward to seeing how much she grows in the last book. I said that Original Sin was not quite what I expected, and that extends beyond the basics. There were a few twists and surprises toward the end of the book, but I liked that they further integrated the story. There was also the matter of Gabe. Gabe was, for various reasons, absent for much of this story, and I have to say that I missed him. Although I like Luc, I like Gabe as well and hope that he will be back in the third book. If you've read Personal Demons, you will definitely want to keep going with the series. And if you haven't started it, pick up Personal Demons and get ready to dive into an edgy paranormal story. As for me, I can't wait to find out what happens in Last Rite!